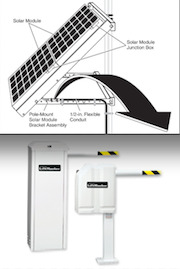 Barrier Gate High-Speed, DC-Powered with Built-In Battery Backup. 10,000 cycles per day with an operator speed of .9 seconds to open or close. Automatic device for protecting private parking area. Working only with battery without external power supply. Articulated arm actuator for swing gates. 220V with limit switches Leaf 2,5 mt. max. 250 Kg. Articulated arm actuator for swing gates. 110V with limit switches Leaf 2,5 mt. max. 250 Kg. Articulated arm actuator for swing gates. 12/24VDC with limit switches Leaf 2 mt. max. 200 Kg. Articulated arm actuator for swing gates. 12/24VDC with limit switches Leaf 1,8 mt. max. 180 Kg. Sliding gates motor 12/24VDC 400Kg. Sliding gates motor. Sliding gates motor 12/24VDC 400Kg. Sliding gates motor 115V 500Kg. Industrial Sliding gates motor 220V 800Kg. Sliding gates motor. Sliding gates motor 115VAC 500Kg. Aluminum. Sliding gates motor 220V 800Kg. Industrial Sliding gates motor 12/24 VDC 400Kg. Industrial Sliding gates motor. Sliding gates motor 12/24 VDC 400Kg.